What is the bohemian diet? Well if it's delicious, healthy and affordable. 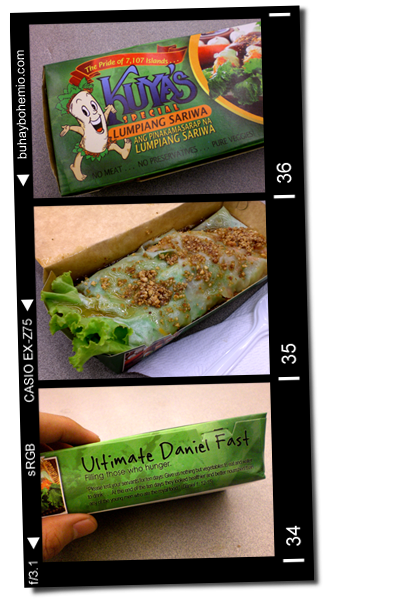 Such as my current favorite food-court item - Kuya's special lumpiang sariwa. What makes this fresh vegetable spring roll so special? I must say that their sauce is quite unique. Aside from the basic ingredients (carrots, heart-of-palm, lettuce and thin wrapper made of flour and egg), the generous serving of ground peanuts, the crispy something that looks like fried vermicelli noodles and a special seasoning brings this lumpiang sariwa to a higher level. All that healthy goodness for only Php45. What's also interesting is their packaging. At the side of the box you will find a verse in the Bible about how a diet of vegetables is good for you.